The 2019 elections for the House of Representatives of the Philippines will be for the 35th lower house in the Philippines and will be held on May 13, 2019. All seats in the House of Representatives of the Philippines will be contested. The winners will serve in the 18th Congress of the Philippines from June 30, 2019, to June 30, 2022.
International media picks up Ressa’s story that there are alleged cases of harassing journalists as one of the President’s specialties. They even call Du30 the strongman president of the Philippines. They depict him as someone who goes after her, a former CNN reporter and a founder of the online news site Rappler. Her news platform caters to just criticize the current government, his works, and allies. Atty, She has criminal charges because of tax evasion and libel. She also faces criticisms through Facebook because of the lies that she spread out. Supporters of Du30 who are also Pro-Marcos troop to the office of news website Rappler to prove to its chief that they are “not trolls.” Trolls refer to netizens employed to attack using inflammatory statements or even fake information on social media. 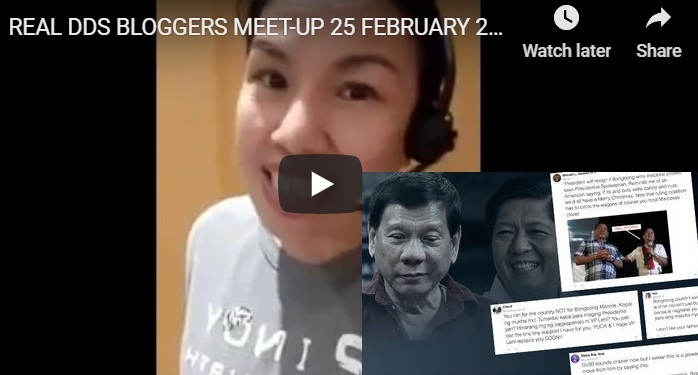 Du30 supporter Mark Lopez made the visit following Ressa’s tweet last week that trolls were deployed to misinform her friends and colleagues such as former United States Secretary of State Madeleine Albright and CNN journalist Christiane Amanpour. Ressa and her cohorts are making noise to cover up the ongoing recount of Bongbong Marcos. The presumptive vice president, Leni Robredo already opposes the recount in Mindanao. Marcos’ counsel, lawyer Vic Rodriguez dismisses the statements of Macalintal that Marcos’ evidence of fraud are not substantial. 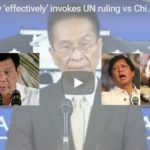 “We believe that all statements coming from Macalintal are nothing but a drive to earn “media mileage” in his quixotic effort to bring relevance to the carcasses of his Senate bid,” Rodriguez said. He added that it is only the tribunal that can decide on the merits of the electoral protest of Marcos against Robredo. Atty. Trixie nails it when she said that the problem with Maria Ressa is that, she does not respect opposing views. She has become a public enemy number one because of her false reports. 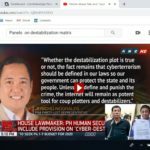 It is in fact not Du30 who suppresses freedom of speech but Ressa’s network that aims to mislead people locally and abroad to destabilize a government that she doesn’t like. Unfortunately for Ressa, common Filipinos do not hesitate to come out of the open to defend the truth because social media has allowed them to voice out, at last for the longest time. The PET suspends the recount for damaged ballots around a month after Marcos asks the Supreme Court to urgently order the technical examination of some voting records. These are from Basilan, Lanao del Sur, and Maguindanao. These are the votes which Marcos wants the PET to nullify due to alleged widespread cheating. The Supreme Court sits as the PET electoral to decide the protests of presidential and vice presidential candidates. Currently, the justices agree that they need to suspend the revision in precinct 8 of Tanjay City, and Negros Oriental due to wet ballots. They direct the head revisor to use decrypted ballot images instead. Revision in clustered precinct 42 in Barangay Sabang, Valencia was also suspended. This is because “no election return is in the ballot box.” “The revision is to proceed as to all other contested precincts,” the source added. The recount of ballots from Marcos’ identified three pilot provinces, Camarines Sur, Iloilo, and Negros Oriental, starts last April 1, 2018. After the recount in the said provinces, the tribunal proceeds on ruling on all objections and claims of both parties during the revision proceeding. The results of the recount in the three provinces would determine if the tribunal should continue checking ballots in the rest of the clustered precincts in nationwide. If upon examination of such ballots and proof, and after making reasonable allowances, the proceedings can stop. Under the Rule 65 of the 2010 Rules of the PET, the protestant or counter-protestant can lose their case. This is if the tribunal is convinced that after all circumstances are taken into account. 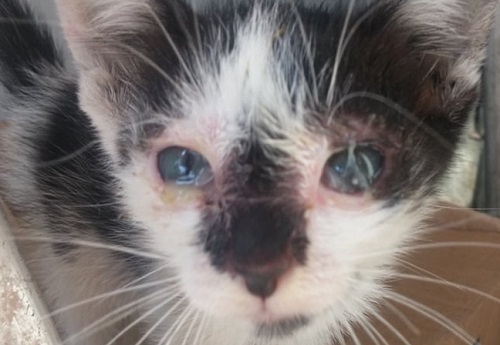 The PET has not released any results of the revision. SC Spokesperson Jose Midas Marquez said the PET will issue a statement to clarify the report on the alleged suspension of the recount. The Supreme Court’s clarification is crucial after the conflicting insinuations from the camps of Marcos and the presumptive Vice President Leni Robredo. 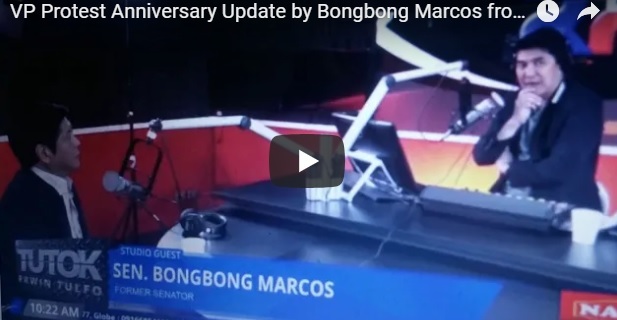 Bongbong Marcos talks to Erwin Tulfo on his Tutok Tulfo program on various issues particularly the update of his electoral protest against VP Leni Robredo. He is generally disappointed with its slow progress. In fact, the President inquires on it because it’s like nothing is happening. 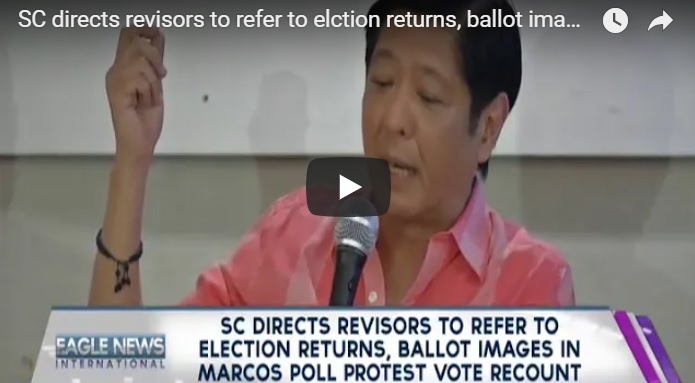 Therefore, Marcos urges the PET that sits as the electoral tribunal of the Supreme Court to fast-track the processes. It is not fair to let the people wait until the next election which is in 2019. 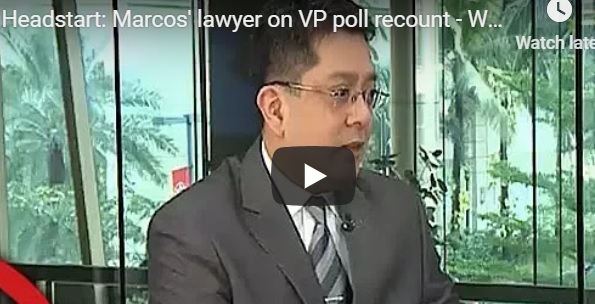 [VIDEO]: The recount of ballot boxes from Iloilo has more anomalies than in Camarines Sur. 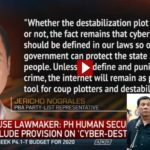 Bongbong Marcos urges the PET to rule on it ASAP. Marcos observes that the condition of the election evidence in Iloilo is far worst than in Camarines Sur. 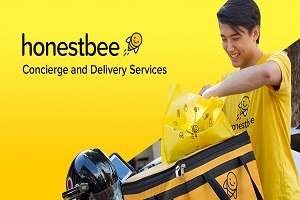 Aside from being wet, and the missing election returns, it is obvious that the picnic boxes that contain the votes do not comply with the standard specified by the ruling. Host, Erwin Tulfo also mentions the fish bones found in the ballot boxes which Marcos confirms. Gov. Imee Marcos earlier hinted on this during her speech in Bacoor, Cavite. What’s odd is that VP Leni Robredo files a motion for grave concern on the magnifying lens use by one of Marcos’ revisors to be able to see clearly and not on the picnic boxes, wet condition, and fish bones found. Marcos stands by his commitment to the Filipino people to fight until each and every valid vote that was cast will be counted. He refrains from filing any additional motions that can delay the process unlike the childish acts of Robredo. It is a pity when his declaration as the winner for the 2016 Vice Presidential race comes only when his term is about to end which was the case for the other protests in the past. The former Senator reiterates that he is definitely not running for Senator this 2019 regardless of the status or outcome of his protest. The PET just have to decide on how to go about the anomalies reported to regain the people’s trust in the country’s electoral system. Marcos also pushes for the elimination of Smartmatic from the upcoming elections. The camp of Robredo accuses the Marcos force of violating Supreme Court (SC) rules in the ongoing recount of vice presidential votes. That was when one of their revisors allegedly used a plastic magnifying lens during the recount proceeding. “Nestor Borromeo opted to use a child’s plastic magnifying glass to see clearly. What difference will this make on the recounting of votes?” he asked. 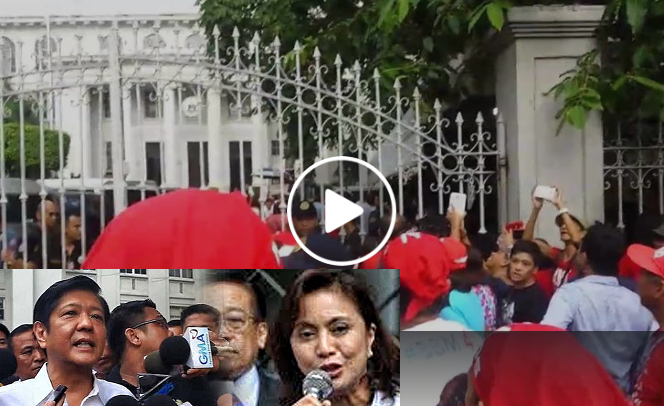 [VIDEO]: A unity walk happens in time for the anniversary of Bongbong Marcos’ filing of the electoral protest against VP Leni Robredo two years ago. In a manifestation of grave concern by Robredo’s lawyers, she calls out on Marcos revisor Nestor Borromeo for allegedly bringing and using a plastic magnifying lens on June 14. They consider it as a prohibited item. The Supreme Court had previously informed both parties that only papers can be brought inside the venue for the revision. Rodriguez said they are expecting “more desperate disruptions” from the Robredo camp. “Not now that the proof of fraud and massive cheating is out in the open. We expect more desperate disruptions to come our way. 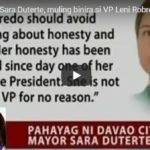 After all, Robredo admitted in a recent TV interview that even though she was out of the loop with the current administration, her way of remaining relevant is “to try to disrupt in the manner in which her office has positioned itself,” he said. Marcos’ spokesperson said they will not allow disruptions. “We won’t allow the election protest to be ‘disrupted ‘ by her desperate, childish and obvious attempts to delay the recount. Instead, we will continue our commitment to the Filipino people to fight until each and every valid vote that was cast will be counted,” Rodriguez added. The supporters of former Senator Bongbong Marcos blast Vice President Leni Robredo for the childish complaint. They take it as a malicious act of Robredo to suppress the truth. A gathering for unity to mark the June 29 electoral protest filing anniversary happens recently. It’s been two years and things are still too slow for the case to progress.